June 15, 2015, is the first ever United Nations World Youth Skills Day. Commemorating this day recognises that the high level of global youth unemployment has become a critical issue for the world, and also that we are capable of working together – governments, civil society and the private sector – to help youth gain the skills they need to gain access to changing labour markets and to make informed work and life choices. Today’s youth are extraordinary in many ways, but two key facts may define it as the most critical generation of our time. First, it is the largest cohort of young people to ever live on the planet. There are 1.2 billion youth between the ages of 15-24 alive today, 87 per cent of which live in developing countries that typically struggle to provide adequate social safety nets. (1) Many countries are experiencing a demographic bulge of its youth population, which can present a number of challenges to society – the first being on the jobs front. The demand to create new jobs can be overwhelming. Most countries will end up with large populations of young people unable to find work. The second key fact of this generation is that they are having a harder time finding work than ever before in recent history. They are three times as likely to unemployed as an adult. (2) In some places they are four or even five times as likely. Of the 120 million youth that entered the workforce in 2013, 80 per cent couldn’t find a job. (3) These two facts taken together have created a situation where youth make up 17 per cent of the world’s population, but 40 per cent of its unemployed population. Across Africa, it is 80 per cent. (4) It is estimated that half the world’s youth are idle – 621 million youth are out of school, unemployed, and not in training. (5) In essence they are stuck. Globally, there are 123 million illiterate youth. Of these, 2/3rd are girls. (12) Behind these youth are another 250 million children of primary school age that aren’t reading and writing, whether in school or out-of-school. (10) Unless something dramatic changes, these children will become tomorrow’s illiterate youth. The result of all this is that there are millions of youth across the globe who are out-of-school, unable to functionally read and write, and struggling to find work to meet basic needs, let alone to find meaningful work, to participate in their communities, or to start young families. Today’s youth should be tomorrow’s civic, political, spiritual and economic leaders, the head’s of new households and drivers of economic growth and community renewal. Youth have energy, enthusiasm and a strong desire to find their identity and place in the world. However, many are not adequately prepared for these roles and have too few opportunities and support to gain the skills required. If these opportunities are not provided, what remains are largely negative or destructive pathways to identity and economic participation. There is risk in ignoring the youth population. Research also links unemployment with reduced participation in community activities and a reduction in measures of social capital like trust and civic engagement. (5) This erosion of social cohesion and the weakening of the bonds that bind youth to their communities leave many youth feeling unfettered and marginalized. They neither derive a sense of belonging and care from their community, nor do they engage and contribute positively to it. This includes underage prostitution, mining, and fireworks manufacturing, along with trafficking and child abuse. The 2012 National Survey on Drug Use and Health showed that about 1 in 6 unemployed workers are addicted to alcohol or drugs — almost twice the rate for full-time workers. (18) Certainly there is reverse casualty at play here, but research strongly indicates that unemployment heightens a person’s likelihood to binge drink, smoke, or have a drug addiction. These are the five critical areas where governments, the private sector and civil society can partner to invest in improved youth employment outcomes. In my work at World Vision, I created a project model called “Youth Ready: for work, for life.” This model, being adapted for use across the globe, helps prepare youth for economic opportunity and to contribute to the greater good and care for others. This includes providing youth with opportunities to gain vocational and technical skills, basic skills like functional literacy, financial literacy and digital literacy, soft skills related to communication, critical thinking, creativity, collaboration among others, as well as to gain on-the-job skills through internship or apprenticeship opportunities. The project model also provides adult mentoring and business coaching, helps the youth form a working savings group, and provides financial support to young entrepreneurs through business plan competitions. As we commemorate World Youth Skills Day, we must highlight the need to close the skills gap by focusing on providing youth access to alternative pathways to skills aquisition in contexts with high rates of school dropout. Offering informal, second chance learning for literacy, life skills and basic skills, and work-based training to further develop soft skills and technical and vocational skills can help out-of-school youth close the skills gap and be prepared to participate and contribute positively in their communities’ economic growth and political, civic and social development. Shout out to the amazing team of colleagues at World Vision, including Bryna Jones, Meredith Hastings, James Pedrick, Paul Newnham, and Kate Williams who helped with this post, including the creation of the infographics from my research, editing of the text, and sharpening of my thoughts. Working with Youth: Addressing the Youth Employment Challenge, May, 2012. Geneva: International Labour Organization. Temporary, Part-time jobs: a Trap for Youth?” International Labour Organization, 2012. The Youth Employment Crisis: A Call for Action; Resolution and Conclusions of the 101st Session of the International Labour Conference. 2012. Geneva: International Labour Organization. “Progress in Getting All Children to school Stalls, but Some Countries Show the Way Forward,” Policy Paper 14 / Fact Sheet 28. UNESCO Institute for Statistics and Education for all Global Monitoring Report. June, 2014. 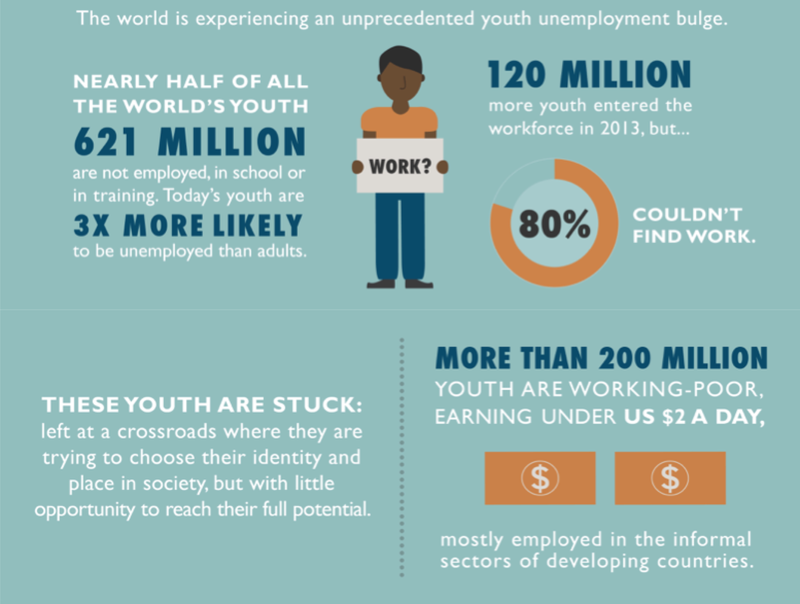 “Youth and Skills: Putting Education to Work”, Education For all Global Monitoring Report. UNESCO, 2012. “Out-of-School Youth in Developing Countries: What the data do (and do not) tell us” EDC, 2010. “Adult and Youth Literacy: National, regional and global trends, 1985-2015” UNESCO Institute for Statistics, 2013. Regional Overview: Youth in Asia and the Pacific. Fact Sheet, Economic and Social Commission for Asia and the Pacific (UNESCAP).